Related: Shaq is the size of a particularly large brontosaurus. You may be under the mistaken impression that the Rock is very large. That he's a very large man. In fact, we've contributed to this impression — I myself believed it as recently as this morning. It's understandable. After all: look at these pictures. He appears muscular to the point of bursting, like a lifelike mannequin stuffed with watermelons. But it's all a lie. Here's the Rock with Shaq and Charles Barkley. He barely reaches Shaq's shoulders. Chuck is twice his width. 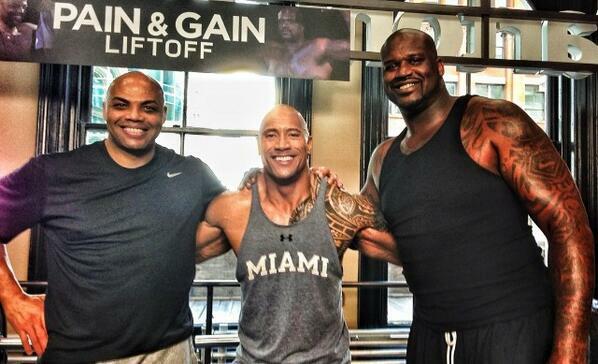 The Rock may be large compared to most of us, but next to these dudes, he's dainty. Related: as the Rock points out, he is 6'4" and 260 lbs. I'm 5'6", 125 lbs. It's possible that standing next to Shaq, I would no longer exist.